Recently I’ve been thinking about “developing a reflective practice” and the parallels I see between my own practice of reflection and the practices of reflection I’m inviting the children to engage in. 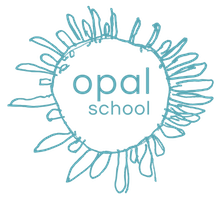 In this month’s member meet-up, Matt and Mary Gage had a conversation with colleagues around the ways we mentor and collaborate with colleagues at Opal School. I sat down to ask my colleague Sarah about her thoughts on this idea of collaboration and mentorship because she and I have been working within a new relationship together. In other places, with previous mentorship relationships, it’s felt like one person had the answer or some kind of specific information to share, but this feels different because it feels like we’re both actually researching together. What struck me most about this statement was the parallels between the reflective practice that I described in my previous post and what Sarah was describing about what we were beginning to do together. The process she was describing was no different than the one I was personally trying to practice and the one I was inviting the children to practice daily. I asked Sarah about mentorship and collaboration and she was describing a practice of research and reflection. Of course, it makes sense that as adults we practice the same things we are asking the children to practice – but until she made that statement, I hadn’t seen the connection quite as clearly. Her statement has been helping me to pay attention in new ways. During my first year at Opal School, Susan said to me, “Don’t ask questions you already know the answer to. What’s the point?” I have repeated this advice to myself time and time again, and this reminder has allowed me to engage in my work with children in a way that wouldn’t have been possible if I was only asking questions I already knew the answer to. As Sarah and I began planning a new unit of study in Story Workshop with the kindergarten and first-graders in Cottonwood, we began by identifying a research question that we were both genuinely curious about and – although we’re both holding theories about that research question – neither one of us has (or expects the other to have) an answer. We began this new unit of study by setting intentions together. This is an exciting time of year because the connections between project work and other parts of the curriculum feel more visible than they did earlier in the year. With this in mind, the intentions that we set included what we want the children to have experiences with as writers, the ways we’re hoping to grow connections and deepen ideas with the emerging project work curriculum, and our own teacher-research questions around the role of materials in supporting young writers. Setting these intentions early on gave us a way to feel grounded as we come together to talk about what we’re noticing, what questions we have, and plan for next steps together. Beginning our work this way supports us with developing shared language and shared meaning and gives us a place to come back to as we reflect together. These intentions will frame what we pay attention to, what resources we might begin to collect, and how we make decisions moving forward. Setting intentions is the same practice we invite the children to engage in during Invitation and Negotiation for Story Workshop daily. Because working together in this way was new for us, Sarah and I made sure to set aside time to plan together. We added a weekly lunch meeting to our calendars as a time to come together to talk, share observations, reflect together on how it’s going, and plan for moving forward. We also made some agreements on how we could communicate with one another outside of this weekly meeting, including where we would share notes, observations, and plans. We’re finding a need for sharing observations and plans, particularly for having a place where we can both talk even when we’re not together. In this space we can include both our zoomed out intentions as well as our more zoomed in intentions (i.e. how one intention for a particular day might fit within the larger intention we set at the beginning). This supports us to better know when to jump in while the other is leading, engage in cross talk, or revise the plan based on our observations of what’s happening that particular day. Sarah and I are entering this collaborating relationship with different roles in the classroom. Sarah is the full-time teacher in Cottonwood and with the children all day. She holds important pieces of the puzzle that I don’t have as someone who only spends a few hours a week in the classroom. She knows who had a hard time separating from their mom at drop off, who forgot their lunch, or who had to get up at 5am to take their grandma to the airport. She knows who did what the day before when I wasn’t there and she knows which partnerships might need a nudge because they seem stuck in a rut. I’m in the classroom less frequently and don’t hold all of those details. These different roles support us both. I miss important details, but it allows me to zoom out and seek patterns that I might otherwise miss. While Sarah holds these incredibly important pieces of the children’s experiences, I can zoom out and look outside of those day to day issues and notice patters that have become invisible to Sarah because she is looking and noticing so closely. This ability to zoom way in and way out supports us both to see greater possibilities than either one of us could do on our own. We have found that mirroring back to one another what we see one another doing and what we see the children doing has supported this part of our collaboration. There is tension that comes from working within a field where accountability and test scores and performance and certainty have high value placed on them. When fear drives our values, it can sometimes feel good to just be told what to do or assume someone else has the answer. But the reality is that we are working in a field where there never will be one right answer. As Matt and Mary Gage said in the member meet-up, we’re all working to make friends with uncertainty. And as Sarah said, it works best when we are researching together. We’re exploring questions that we don’t know the answer to, because those are the questions worth exploring. As teachers we are paying attention to so many things all the time. And we do our best work when we work together to ground our teaching practices in research and reflection. When we look closely at the conditions we’re creating in the classroom and the experiences of the children we work with each day, when we share our observations and questions and theories, and when we ask ourselves and one another, “what else could this be?” We have a responsibility to help one another make friends with uncertainty so that we don’t get lost behind false certainties or rely on false, simple solutions to complex issues, so that we can continue to engage in a practice of research and reflection. What does collaboration with colleagues look like in your setting? What have you found that supports collaboration? What challenges do you face? What parallels do you see between how you work together with colleagues and how you are asking children to work together? What do you do to support one another to make friends with uncertainty?